A key component to the Chicago Blackhawks Stanley Cup Championships in 2010 and 2013, Marian Hossa cards and autographed memorabilia have seen an increase in demand. Hossa is from Slovakia. The small country is very supportive of their homegrown talent, giving his collectibles an international appeal as well. 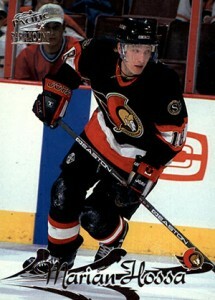 Hossa was drafted by the Ottawa Senators with the 12th pick in the 1997 NHL Entry Draft. 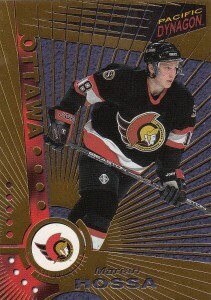 He played his first seven seasons with the Sens before signing as a free agent with such NHL powerhouses as the Pittsburgh Penguins and Detroit Red Wings. Despite back-to-back Stanley Cup Finals appearances with both teams, it wouldn't be until his move to the Blackhawks that he would win one. 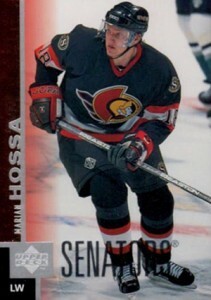 Hossa has six rookie cards. All of the them were produced in 1997-98. He also has a very rare, pre-rookie card from a 1992-93 Quebec Pee-Wee Tournament set that commands top dollar on the secondary market. His first NHL certified autograph card is from 1998-99 Be A Player. A Gold parallel also exists. Neither of the cards are serial numbered and the exact print runs are not known. 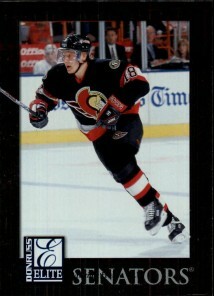 Marian Hossa's first game-used memorabilia cards were issued in 1998-99 Topps Stadium Club and 1998-99 Upper Deck MVP. Hossa's autographed memorabilia has seen an increase in demand since his two Stanley Cup Championships with the Chicago Blackhawks. A fan favorite, he is a well respected player throughout the league. His long-term investment potential is bright. The foil board used to create the Elite set is very condition sensitive. Professionally graded examples receiving top grades carry a premium. 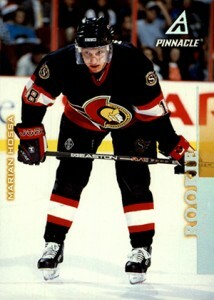 This is one of Hossa's most popular rookie cards. Despite not being autographed or serial numbered, its design stands out and results in higher prices. This card is a perfect example of what made Pacific different from other manufacturers. The dynamic design, with silver and foil reflective technology, creates a striking aesthetic. Some collectors prefer a simple design with a full-bleed player image. Paramount was a perfect brand to deliver those design elements. After making a big splash as a premium brand in the early 1990s, Pinnacle was lost in the mix by the time the company went under. That said, the full-bleed design used in 1997-98 is solid for its use of great photography. Hossa's rookie may not be worth a ton, but it looks great. 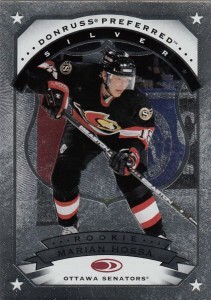 If you are looking for the top Marian Hossa rookie, only Donruss Preferred rivals this one. The brand recognition and solid design work to its favor. 2006-07 UD BAP AUTO Marian Hossa Upper Deck Be A Player 06 07 Signatures SP? !!! Marian Hossa 16 17 Upper Deck 500 Goal Club Game Used Jersey SP! 1997 Pinnacle #17 Marian Hossa Rookie RC PSA 9 MINT. Ottawa Senators New Case! Below you will find examples of what an authentic Marian Hossa autograph looks like. This can be used as a first point of reference for determining the legitimacy of autograph memorabilia, but is not a substitute for having your items authenticated by a well-respected professional autograph authentication company. Some of the trusted sources within the sports memorabilia market include the following companies: PSA, JSA, and Mounted Memories. Click on any of the images below to view full size photos. No discernible letters are present. The signature consists of a handful of pen strokes. 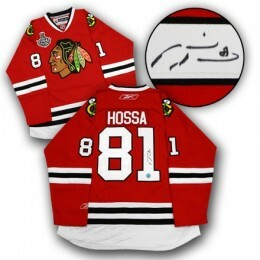 Comparing to an existing, authenticated example is the best way to discern if a Hossa signature is legitimate.